Our freshwater fly fishing holidays give you the chance to travel the world whilst catching monster species. We have a wide range of exclusive destinations for our customers which provide top conditions for freshwater fly fishing. Our team takes care of organising the entire holiday for you, including flights, accommodation, transfers and fishing tackle if needed. Orklagaard lodge gives anglers the best chance of connecting with multiple Orkla river Salmon whilst fishing this fantastic river. This lodge treats each and every guest to superb hospitality and genuine care, a week at Orklagaard puts you in some of the best hands in the business. This newly discovered world-class rainbow trout fishery is deserving of some serious recognition. For years, passionate trout anglers the world over have heard stories about former program Jurassic Lake, and now, we’re thrilled to announce we’ve found a new location that exceeds our old stomping grounds! Worlds’ End Lodge and the Irigoyen River offer the most unique and otherworldly fishery in Patagonia. No other Tierra del Fuego fishing lodge or river offers 10-20 lb Sea Run Brown Trout in small water that is laden with logs, surrounded by dense forests and protected from the heavy Austral winds. Exploring this vast area of water is an eye opener to what real Swedish Pike Fishing is all about. Casting your fly into parts of this water system that no other angler has, for fish that have never seen a fly or lure before. These fish are all about raw aggression and the takes can literally take your breath away! If you are a single angler or just looking to travel in a group with like-minded people who all enjoy the art of fly fishing for big wild Sea Trout well this trip is designed just for you. 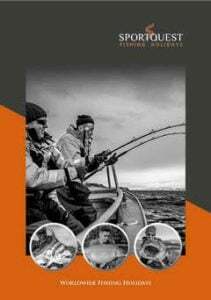 Teaming up with our partners at Solid Adventures we have some exclusive weeks on offer for our very own hosted Sea Trout fishing weeks. The Sog River is recognized as one of the finest Atlantic Salmon rivers in Iceland, it is also the largest spring fed river in Iceland. Our beat Sydri Bru is the most productive beat on the river with old catch records indicating that anything from 140 to 240 salmon caught each year. Our freshwater fly fishing holidays will take you to some amazing destinations including Norway, Argentina, Brazil, Greenland, Sweden, Iceland, Bolivia, Canada plus more. These destinations give you the chance to target some incredible species such as Atlantic Salmon, Pacific, King, Silver Chum and Sockeye Salmon. You can also target Sea Trout, Brown Trout and massive Rainbow Trout. One of our popular destinations is the the Gaula River and the Reisastua River in Norway. These rivers allow you to catch some spectacular Salmon. Each cast is in the clean, rushing water and brings with it the possibility of a take from a 40lb plus Salmon. Another fantastic freshwater fly fishing holiday is the Rio Gallegos fishing at El Rincon. This destination boasts fresh run Sea Trout up to 25lbs and resident Brown Trout averaging 4 lbs, but with many large specimens up into double figures. We specialise in making sure you get the best fly fishing experience available, our experts in the office will be on hand to offer any advice and answer any questions you have leading up to the holiday of your dreams. You can contact us via our website or call us on 01603 407596.